My master’s professor, Dr Carin Combrinck, and I co-authored a book chapter on the role of architects and architecture in the re-development of South Africa for a book project co-ordinated by the Isandla Institute, UCT and the African Centre for Cities. The South African policy landscape regarding Human Settlement development reflects a progressive approach towards the in-situ upgrading of informal settlements. With the assistance of the World Bank and the Cities Alliance, the National Upgrading Support Programme (NUSP) was established in 2008 to facilitate the implementation of the Upgrading of Informal Settlements Programme (UISP) which is further underpinned by the 2009 National Housing Code Part 3 Volume 4: Upgrading Informal Settlements. The policy intent is aimed at a holistic integration of informal settlements into the urban and socio-economic fabric of the greater metropolitan area with a strong focus on locally appropriate community participation (SA 2009:s 2(1)). Factors such as the careful maintenance of existing community survival networks as well as the harnessing of local knowledge and understanding of particular needs are given high priority in the development process (SA 2009:s 3(9)). In terms of the implementation of this process, the Housing Code makes allowance for the primary role players to be the state in its various functions. Resources are then included from the private sector by way of the professional services of engineers, town planning, land surveying, geotechnical services, Environmental Impact assessment (EIA) services and site supervision (SA 2009:s 2(5.3)). Along with the general provision for the housing process, the Act also allows for the establishment of a mediating body (Community Resource Organisations – CRO’s) that can offer a platform for technical assistance to the communities and financial accountability to the state. These can either be the municipalities themselves, Non-governmental organisations (NGO’s) or Community Based Organisations (CBO’s). The prerequisite is that they must be a legal entity through which the community may then apply for this funding. As can be seen from the short description of the policies relevant to the upgrading of informal settlements, a holistic and progressive context is established where the potential exists for a well-balanced involvement of state, civil society (private sector built environment professionals) and beneficiary communities in the development process. Yet, rising dissatisfaction among the urban poor has resulted in an increased level of service delivery protests (Tissington 2011), indicating an uncomfortable disjuncture between such policies and their implementation. This chapter focuses on two questions emanating from these policies: Firstly, given the apparently benign and progressive wording of these policies, wherein lies the Navigating hostile territory disjuncture with their implementation? Secondly, do these policies describe a potential role for architecture in this discourse and if so, how? In consideration of these two matters, the chapter will investigate the potential role of young architectural professionals to engage in the context of in-situ upgrading of informal settlements. Interviews conducted with Prof Marie Huchzermeyer (recognized publisher in the filed of informal settlement upgrade), Mr Steve Topham (director of NUSP), Prof Lone Poulsen (previous Dean of Wits School of Architecture) and Dr Mark Napier (previously of Urban Landmark and currently head researcher in Human Settlements at the CSIR) serve to situate some of the discussion in current discourse. 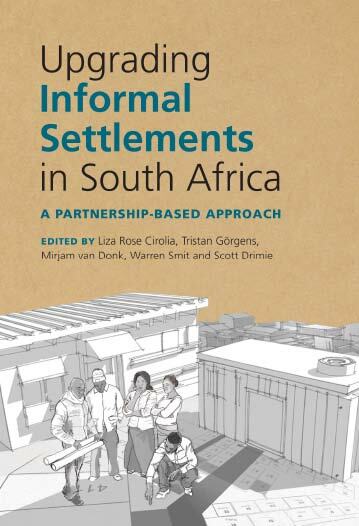 Personal reflection on experiences in particular informal settlements further inform and contextualise the conclusions drawn in the chapter.